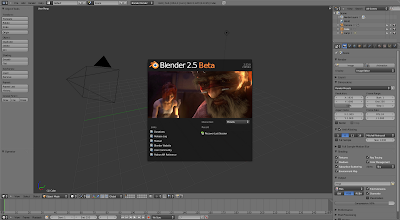 Released as free software under the GNU General Public License, Blender is available for a number of operating systems, including Linux, Mac OS X, and Microsoft Windows. Blender is one of the best applications overall we have on Linux, yet. Unfortunately it requires some time to learn how to use it, but once you get around that, it's simply amazing! Also, you probably already know this, but I had to mention it: Blender was the application used to create the now famous Elephants Dream, Big Buck Bunny or Yo Frankie! or Sintel (currently in production) short movies. Blender 2.5 beta (aka 2.53 beta) has just been released, so the final Blender 2.5x is expected very soon. Blender 2.53 beta includes all the features that will be available in the final Blender 2.5x, meaning there will be no new features from now on included in the 2.5x series. Blender isn't just an amazing application, but everything related to it is great - because of this, there's no need to post here what's new, simply visit the Blender 2.5x release log and you'll find out everything regarding this release.